We all make mistakes. Some mistakes may be grand; others may be small. Either way, a mistake should be viewed as an opportunity to learn. But oftentimes when people make mistakes, they may attack their own characters. For example, a person may refer to himself or herself as “stupid” or an “idiot” when they make a mistake. This attacking of self can be extremely destructive, because people may actually start to believe the negative things they’re saying about themselves, which in turn can negatively affect their self-esteem and mental state. When we make mistakes, it is important to keep in mind that we are all human and we cannot be perfect. 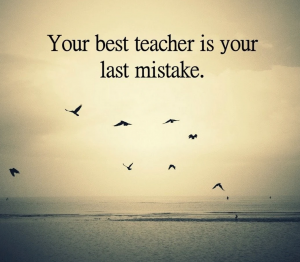 Know that it is normal to make mistakes and all we can do is learn from them. With this mentality, it is less likely for your self-esteem to diminish, which in turn helps preserve a positive state of mind.